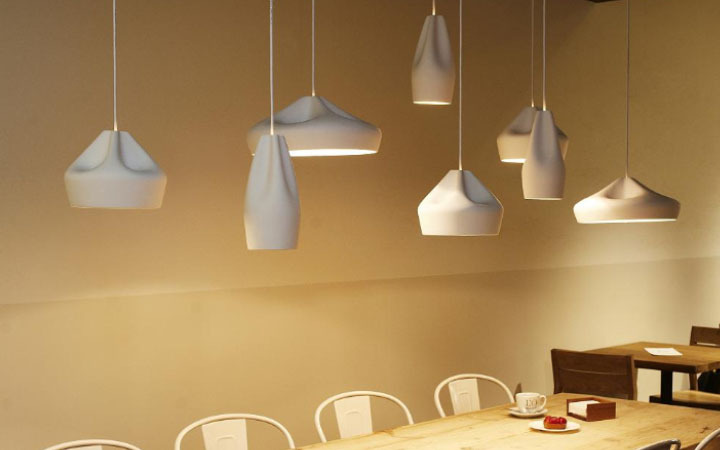 A collection of ceramic pendants designed to "crease" like cloth on the outside and emit a warm glow from the inside. Designed in Barcelona by master ceramicist Xacier Manosa and the Mashallah Design Studio. The designers behind the Pleat Box Collection for Marset come from two differing schools of design thought. Mashallah Design Studio, a two-person team specializing in digital design in Berlin; and Xavier Mañosa, a master ceramicist from Barcelona. Xavier Mañosa trained as an industrial designer, later becoming a modern-day ceramicist in the footsteps of his parents. His work boldly combines different materials and explores new forms of expression. Hande Akçayli & Murat Koçyigit make up the Mashallah Design Studio, an interdisciplinary practice merging art and technology into digital designs. Great for kitchens and dining rooms, the Marset Pleat Box 9 Pendant is a sophisticated combination of a digitally-designed crease in a piece of cloth and ceramic. This unique dichotomy showcases the elegant relationship between a soft appearance and a structurally firm composition. The Marset Pleat Box 5 Pendant is a beautifully unusual combination of "visually soft" and "structurally firm." Choose from a Gold interior for a warmer light, or opt for the White enamel for a glittering effect. A sophisticated combination between a digitally-designed crease in a piece of cloth and ceramic gives the Marset Pleat Box 14 Pendant a unique dichotomy between a soft appearance and a structurally firm composition. The shade is available with a brilliant white enamel or gold interior, the latter of which generates an extremely warm light.